Musician, Composer, Author, Editor, Journalist, Engineer, Producer, Music Technology Expert — Mitch Gallagher is known by a diverse array of titles, all based on his lifelong love for all things musical. Some know Mitch best for the more than 1,500 videos he has hosted and countless articles he has written for music gear retail giant, Sweetwater. Others have read his books, including the best-selling Guitar Tone: Pursuing the Ultimate Guitar Sound, and more than 1,000 published magazine articles. Still others know him as the former Editor-in-Chief of EQ magazine and Senior Technical Editor of Keyboard magazine. Many have attended his guitar tone and music technology clinics and workshops around the world. Now Mitch Gallagher has returned to his roots as a master guitarist and composer with the release of his new EP, FOUNDATION! 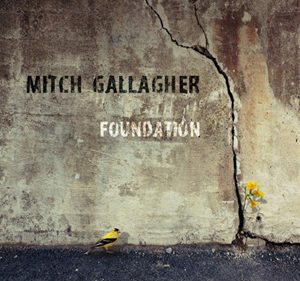 If you're a fan of catchy melodic jazz/funk/blues/rock guitar, you'll love Mitch Gallagher's FOUNDATION! A classically trained, NARAS (Grammy) award winning composer in addition to being an incredible guitarist — and a well-known journalist, author, technology expert, and internet personality, to boot — Gallagher infused these five instrumental songs with heart, soul, melody, rhythm, and dynamics, and recorded them live in the studio with a stellar cast of musicians including Keith Carlock (drums — Steely Dan, Mike Stern, Sting, Toto), Michael Whittaker (keyboards — well-known L.A. and Nashville session musician, film/TV composer), and Adam Nitti (bass — Nashville session musician, Michael McDonald, Dave Weckl, Kenny Loggins). Special guests include Supertramp/solo artist/L.A. master session guitarist Carl Verheyen and Nashville session ace/rising star Tyler Summers on saxophone, as well as a powerhouse horn section featuring Nashville's best! Because these songs were created first and foremost as musical stories/compositions, rather than just as platforms for meaningless "shredding," they're hummable, memorable, and stand up to repeated listening — you'll return to hear FOUNDATION again and again! All of the musicians perform within the framework of the song — playing for the song and contributing emotional colors and dynamics, rather than simply showing off. Every part, every performance, every note is integral to the song arrangements and enhances the artistic result, making for a wholly satisfying listening experience. Recorded and mixed with audiophile sound quality at Sweetwater Studios and Oceanway Nashville Studios, FOUNDATION delivers a pure, organic presentation of top musicians creating music in a stellar acoustic space. Minimal processing was used on the tracks, and only the finest equipment was employed, resulting in a recording that feels and sounds, in a word, natural. Renowned mastering engineer Scott Hull at Masterdisk put the finishing touches on the sonics, creating an incredible listener experience focused on the tones, compositions, and performances. You'll feel as if you're in the best room around, listening to great players performing just for you. The attention to detail for this project extends even to the artwork, which was designed and created by the legendary artist Hugh Syme (Rush, Megadeth, Dream Theater). Order your copy of FOUNDATION now! Mitch Gallagher is the author of nearly 1,000 published magazine articles - feature articles, reviews, how-tos, interviews, and more - in U.S. publications, as well as numerous international publications. FOUNDATION, Mitch's new EP, is now available. An eclectic mix of genres creates a sound unique and exciting. Order now! Mitch has written many books on the topics of guitar tone, studio design, music technology, and recording. Interested in buying my new album? I try to respond to all emails within 24 hours. © 2018 MitchGallagher.com. All Rights Reserved.